Pre-order online from CUA Press here. Download the pre-order form and flyer. Anticipated release in October 2015. If video of Reggie and Dan does not appear, watch it here on YouTube. From the first encounter with the Latin language to its full presentation in 105 encounters, the objective of Ossa Latinitatis Sola is to get people into immediate contact with and understanding of genuine Latin authors, and for these encounters to grow into a love and use of the entire language in all its literary types and periods of time and authors of the past 2,300 years. Reginald Foster’s method of teaching the Latin language is the result of over forty years of helping people in Rome to grow fast and solidly in the knowledge, use and appreciation of Latin by anticipating their questions and preempting their future problems. The complications and obscurities of certain other methods are hereby necessarily avoided. For a fuller description, click on this link. Reginaldus Thomas Foster recently retired after 40 years serving as the personal Latin secretary of Pope Paul VI, John Paul I, John Paul II, Benedict XVI. His office was in the “Latin Letters” section of the Secretariat of State in the Vatican. He continues to teach Latin classes in summer and during academic term at his own school in Milwaukee. Daniel Patricius McCarthy, a student of Foster’s, is a monk at St. Benedict’s Abbey in Atchison, Kansas. 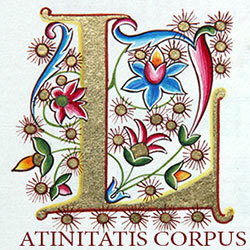 He teaches liturgy and the Latin language in London as a guest professor of KU Leuven. He teaches church art and architecture at his abbey in Atchison in conjunction with the Archdiocese of Kansas City in Kansas. He is soon to begin teaching in Rome. Introductary comments by Daniel Gallagher and James Leachman. 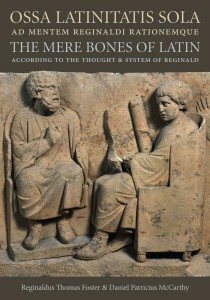 OSSIVM CARNES MVLTAE Locutionis indoles ac natura Ciceronis in epistulae: The Bones’ Meats Abundant: the Character and Nature of Speech in Cicero’s Letters. OS PRAESENS CICERONIS EPISTVLARIS: The Immediate Mouth of Cicero in his Letters. OSSIBVS LVDI EXERCENDIS: Games for Exercising the Bones.